Queen’s University’s Department of Ophthalmology is proud to announce the South East Ontario Vision Rehabilitation Service (SOVRS), in collaboration with the Vision Rehabilitation Clinic at Kingston Health Sciences Centre – Hotel Dieu Site (KHSC), and Vision Loss Rehabilitation Ontario (VLRO), a division of the Canadian National Institute for the Blind, and with the financial support and guidance of the South East Local Health Integration Network (SELHIN). SOVRS is a person-centred, integrated system of care for individuals with vision loss, focusing on safety, independence and quality of life. SOVRS brings together a team of vision rehabilitation professionals who provide assessment and tailored rehabilitation plans that include learning adaptive strategies for daily activities, using visual aids and technologies, and accessing available funding and support services close to home. Please note: There are no cut-offs for visual acuity or field of vision. Some clients may have good acuity and relatively good field of vision, but have other functional deficits (eg oculomotor dysfunction, ring scotomas, etc). 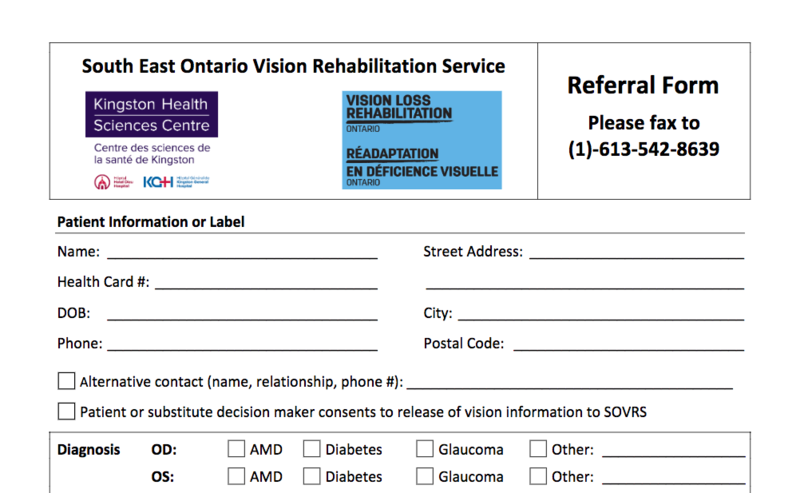 To refer an individual with vision loss for service, please complete the SOVRS referral form and fax to 613-542-8639. For questions about SOVRS, please contact 613-544-3400 x2475. Read more about the SOVRS at KHSC.